This is the most common type of vascular ulcer. Patients often have a history of lower limb oedema (swollen legs), varicose veins, or damaged leaking veins (venous insufficiency). Or may have previously had thrombosis (blood clots) in either the superficial or the deep veins of their legs (post-thrombotic ulcers). Venous leg ulcers occur predominantly on the lower limb above or in the vicinity of the malleolus (ankle). Working standing up for more than six hours per day leads to an increased incidence of varicose veins in both women and men. Arterial ulcers occur less frequently than venous ulcers. family history of peripheral vascular disease or coronary heart disease. Mixed ulcers are the result of a combination of both venous and arterial disease. Mixed aetiology ulcers are complex and can change their character rapidly e.g. when the arterial disease is rapidly progressive. If the arterial disease is left untreated because it is progressive the arterial problem will eventually be the major factor to consider when making treatment decisions. 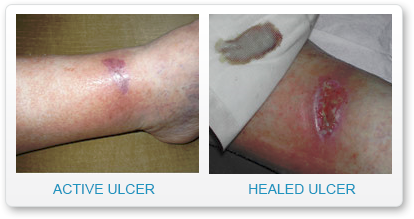 Ulcers usually originate (95% of cases) from an arterial or venous circulatory disorder. The proportion of ulcers with a mixed arterial-venous origin has increased during the past few decades, as a result of an ageing population with concomitant arterial problems. This aetiology further complicates the healing. 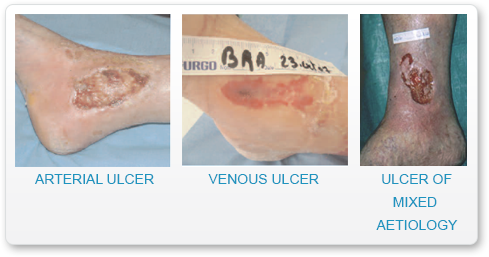 Some conditions cause wounds that are similar in appearance to leg ulcers due to vascular complications. It is therefore very important that these different conditions are not confused since the appropriate treatment for one disease may be contraindicated for another one. Other vascular causes are represented by hypertension (Martorell), diabetes, haematological and clotting disorders. Rarer causes include vasculitis, pyoderma gangrenosum, infectious diseases, malignancies (carcinomas), calciphylaxis (diabetes) and drug-induced ulcers (hydroxyurea). very rare skin metastases observed in systemic cancers. Complications resulting from leg ulcers include loss of mobility and the risk of infection. Immobility can make the ulcer worse, due to increased venous blood pressure (venous hypertension) and also increase the patient’s dependence and sense of isolation. Occasionally long term infection can lead to conditions such as cellulitis or septicaemia. Unusually, if ulcers are present for many years a malignant tumour may arise (squamous cell carcinoma) with a poor prognosis. For some patients the psychological impact of leg ulcers leads to anxiety and depression the mental health of the patient should be carefully monitored and the appropriate support provided if necessary. If the underlying medical cause of the ulcer is known then it is essential to treat it. Hypertension will respond to medication and weight reduction may also be implemented. If exercise is possible a minimal regimen of moderate exercise will help improve the blood flow in the legs. If the patient has diabetes then their blood sugar levels should be closely monitored and their treatment reassessed. In ulcers of arterial origin, revascularisation of the lower limb is the first treatment to propose: balloon angioplasty or stenting that relieves obstruction of the artery or by-pass surgery are procedures that should be considered. Pain is an overriding problem in patients with arterial ulcers and this should always be addressed. Predominantly venous ulcers will benefit from the use of compression. Compression is a simple, effective treatment that acts by squeezing the leg (by direct application of pressure, measured in mmHg) to stimulate venous return towards the heart and reduce oedema. Compression bandaging is an integral part of wound healing and patients should understand the importance of concordance with this treatment. Compression therapy has been used since ancient times. It is still the cornerstone of treatment for phlebological and lymphatic conditions. Compression is a simple, effective treatment that acts by squeezing the leg (by direct application of pressure, measured in mmHg) to stimulate venous return towards the heart and reduce oedema. The level of pressure required depends on both the condition to be treated and the patient’s capacity to tolerate this pressure. in the correction and prevention of dynamic or mechanical lymphatic insufficiency (lymphoedema), etc. Compression restores a normal venous flow from distal regions (extremities of the limbs) to proximal regions (roots of the limbs). It also aims to optimise the action of the venous muscle pump in order to restore the normal flow and direction of venous blood on exertion (from the superficial to the deep venous network and from distal to proximal tissues). Its use will accelerate and maintain the healing of leg ulcers of venous or mixed aetiological origin. If the wound is infected or heavily exuding/sloughy, dressings that purify or clean the wound should be chosen. If the wound is not infected and is debrided then a dressing that ensures a moist wound healing environment and can accelerate healing in the presence of high levels of MMPs is possible. Dressings should be non-adhesive to ensure the integrity of the surrounding skin. A simple contact layer may be used under the compression bandages once healing has reached the epithelialisation stage. Once healing is complete, the site of the ulcer is a weak point in the skin and a potential risk for recurrence. The compression bandage may be replaced by compression stockings which are easier for the patient to manage because their use may be necessary for several years depending on local protocols. Compression stockings must be correctly fitted for the patient’s leg size. COMPRESSION SHOULD NEVER BE USED IN THE TREATMENT OF ARTERIAL ULCERS. Debridement may be required to remove necrotic tissue; hydrogel type dressings are suitable for this purpose. NB If vascularisation is too severely impaired for a normal healing process, hydrogel dressings under occlusive dressings are contraindicated. The ulcers should be monitored for the signs and symptoms of infection that may involve the soft tissues or bone. Non-adhesive dressings are particularly useful for arterial ulcers to protect from external damage and to maintain a moist wound environment. Healing can be accelerated by the use of dressings that combat the high damaging levels of MMPs in the wound. At the epithelialisation stage, a simple contact layer may be used to protect the surface of the skin. If the patient’s ABPI is between 0.7 and 0.9 then reduced compression bandaging can be used as an integral part of wound healing depending on local protocols. Patients should understand the importance of concordance with this treatment. If the wound is heavily exuding or infected dressings that purify or clean the wound should be chosen. If the wound is not infected then a dressing that ensures a moist wound healing environment and can accelerate healing in the presence of high levels of MMPs is possible. Dressings should be non-adhesive to ensure the integrity of the surrounding skin. A simple contact layer may be used under the compression bandages once healing has reached the epithelialisation stage. Once healing is complete, the site of the ulcer is a weak point in the skin and a potential risk for recurrence. The compression bandage may be replaced by compression stockings which are easier for the patient to manage because their use may be necessary for several years depending on local protocols. These must be correctly fitted for the patient’s leg size. Because of the high risk of infection patients should be persuaded to keep themselves and their environment as clean as possible. Regular washing and the use of clean clothes may be more difficult in older and immobile patients. The ulcers and the surrounding skin must never be touched without first washing the hands. Skin problems can occur with both venous and arterial disease and the skin needs to be protected as much as possible from the effects of trauma. Patients with venous ulcers often suffer from local tissue ischaemia and trophic problems: atrophie blanche, varicose eczema, pigmented purpuric dermatitis, etc. Patients should report any itching and discomfort which can be alleviated by the use of paraben-free, hypoallergenic emollients. Patients should be encouraged to eat a healthy diet that contains a variety of fresh fruits, vegetables, dairy, grains and proteins and drink plenty of fluids. Patients should be as active as possible and carry out their normal activities. Walking should be encouraged but patients should not stand still or sit for long periods. For venous origin ulcers only the leg should be raised at night. This may be achieved by putting some pillows under the end of the mattress.